The fear of what Fed Chair Janet Yellen on Tuesday – and other Fed governors earlier – called ‘waiting too long’ before raising interest rates is increasingly inserting itself into Fed pronouncements. 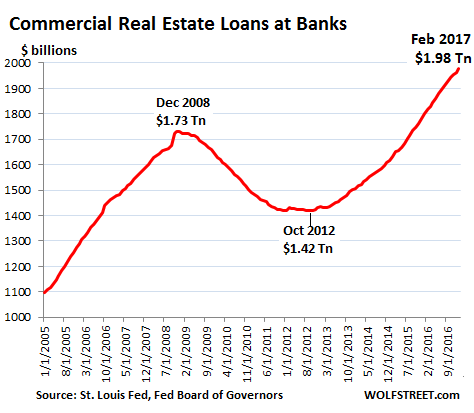 One of the aspects – and this is getting articulated with increasing intensity – is commercial real estate (CRE) and its impact on banks whose nearly $2 trillion in CRE loans are backed by collateral whose boom-prices are known to crash periodically in phenomenal busts. Boom and bust: that’s the material CRE is made of. We had seven years of boom, and now the Fed is worried about the bust. Yellen didn’t mention CRE in her prepared testimony on Tuesday before the Senate Committee on Banking, Housing, and Urban Affairs. But it featured in the twice-yearly report that the Fed delivered to Congress in support of Yellen’s testimony. And it wasn’t the first time that it was mentioned in these twice-yearly reports – but the fifth time in a row. This post was published at Wolf Street on Feb 15, 2017. Will Trump’s Tax Cut Happen in 2017?